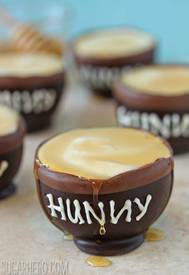 These chocolate bowls are one of my favorite ways to fancy up dessert. They’re easy to make—Pooh might say they’re very little bother—but they look elegant and always impress people! If honey-white chocolate mousse isn’t your thing, you can fill them with ice cream, whipped cream, curds, or other mousses instead. They can even be used to hold candies or other treats at parties.